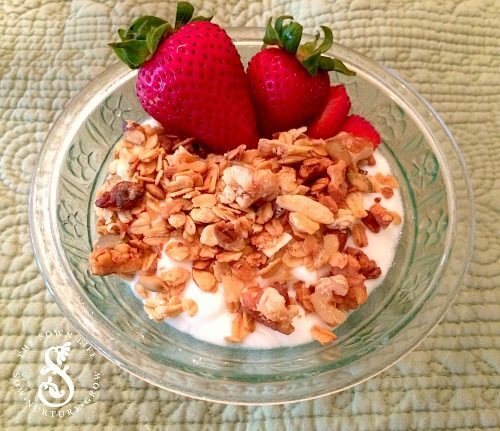 This granola has been a long-standing family favorite. I’ve been making it for years and often get asked for the recipe. It tastes way better than any store-bought granola, with much less added sugar. 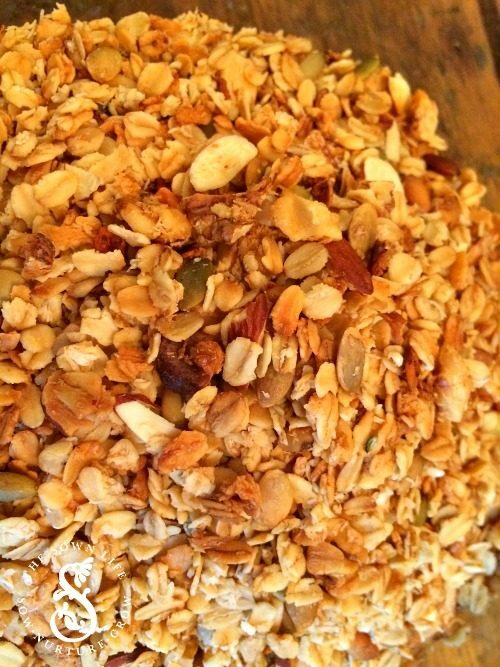 Making your own granola can really save you money as well. Why buy an expensive box when you can make your own and fill it with goodness? Oats are very good for balancing hormones; they help the body build up progesterone and testosterone, which balances out estrogen, which is much needed if you are estrogen dominant. Also, I just need to tell you what I’ve learned about chia seeds over the years.These little guys are an amazing superfood! Per ounce, they have more Omega-3s than salmon, 11 grams of fiber and 4 grams of protein. As if that wasn’t enough, they are loaded with antioxidants and calcium and help feed the good bacteria in your gut. Amazing! All the ingredients in this granola provide sustainable energy and won’t give you a sugar crash. Also, it’s very yummy, I call that a win. Please enjoy this family favorite and all the goodness that comes with it! 2. Combine oats, coconut, walnuts, hemp seeds and chia seeds in a large bowl. 3. Melt butter, olive oil, maple syrup and coconut sugar over medium-low heat until sugar has dissolved. Add sea salt, cinnamon and vanilla. Pour over dry ingredients and mix well. 4. Line large cookie sheet with parchment paper. Layer the mixed granola evenly on the pan and put in the oven for 10 minutes. Remove from oven and stir. Put back in the oven for 5-10 more minutes. 5. Let cool and then break the granola apart. Store in an airtight container and enjoy for breakfast or a snack! Combine oats, coconut, walnuts, hemp seeds and chia seeds in a large bowl. Melt butter, olive oil, maple syrup and coconut sugar over medium-low heat until sugar has dissolved. Add sea salt, cinnamon and vanilla. Pour over dry ingredients and mix well. Line large cookie sheet with parchment paper. 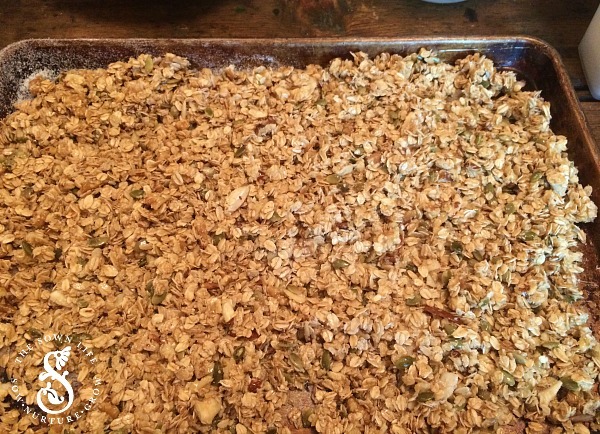 Layer the mixed granola evenly on the pan and put in the oven for 10 minutes. Remove from oven and stir. Put back in the oven for 5-10 more minutes. Let cool and then break the granola apart. Store in an airtight container and enjoy for breakfast or a snack!